Strategy “Daily Volatility Breakout” – is a very simple strategy based on pending orders BuyStop and SellStop which levels of installation are determined with very simple formula and depend from market volatility index of previous day. 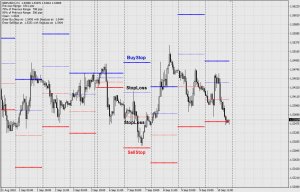 Recommended trading steams are EURJPY and GBPUSD. 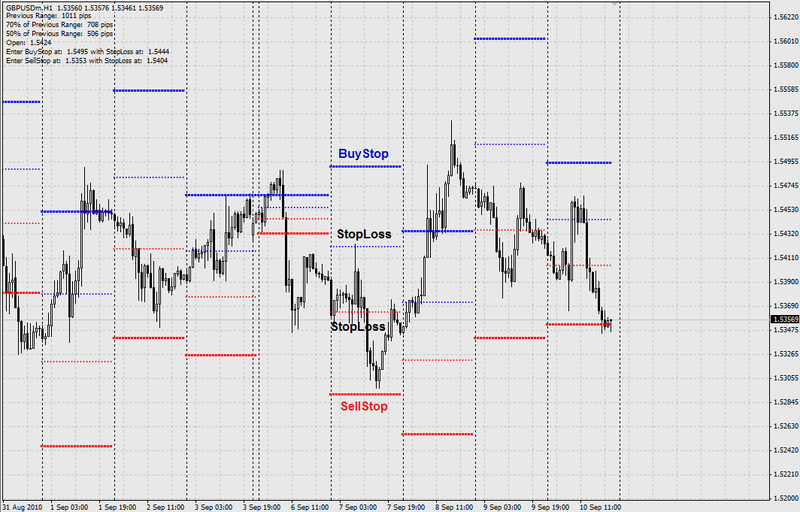 BuyStop is an opening price of the today’s market + 70 % of a previous day’s candle + spread size on trading pair. StopLoss = 50 % from size of a previous day’s candle. StopLoss = 50 % from size of a yesterday’s day candle. For the calculation of the pending orders level exhibition and StopLoss levels you can use indicator Daily Volatility Breakout, the link for downloading is below. It is important! As soon as the profit will be +50 – +70 pips – change StopLoss level in the «in the black» level If you want you can use trailing-stop on distance – 35-50 pips. TakeProfit in this strategy it is not established — closing of transaction is made at closing of day or with a trailing-stop. - All pending orders which within day didn’t work must be closed before end of the day. - If one of pending orders has worked, then the second pending order that didn’t work, must be removed.